Impressive large format nautical chart of the West Indies. Chart of the Gulf of Mexico and Windward Passages including the Islands of Cuba, Haiti, Jamaica Puerto Rico and the Bahamas. 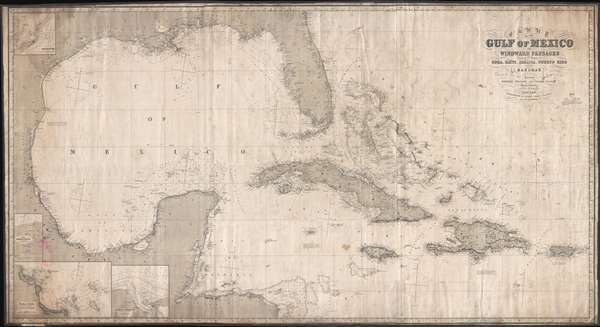 A large and expansive 1871 James Imray blueback nautical chart or maritime map of the Gulf of Mexico and the West Indies, including the Greater Antilles. As a working chart, it bears all of the hallmarks of a shipboard chart and a life at sea, including pencil marks related to navigation. The map covers from Mexico to the Virgin Island and from northern Florida to Honduras, including all of the Gulf of Mexico, Cuba, Florida, the Yucatan, Santo Domingo (Hispaniola), Jamaica, Porto Rico, and the Bahamas, as well as the Gulf Coast in the vicinity of Texas, Mississippi, Louisiana, and Alabama. Inset maps detail the River Goazacolcos, the port of Veracruz (Mexico), and the Laguna de Terminos. This chart probably has its origin in 1851, which is the earliest example we have been able to identify. The elaborate titling suggests that the plate was only lightly updated from that date. The labeling of East Florida and West Florida, designations obscene since about 1850, further confirm this. This map is owned jointly by Geographicus and Vetus Carta Maps.